Plowboys Barbeque Sweet 180 BBQ Sauce 16 oz. Sweet 180 Kansas City-style sauce was created for competition with complex flavors and excellent glazing properties. 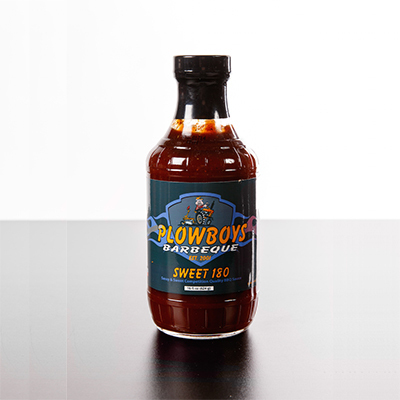 This sauce helped Pork Pullin' Plowboys score a perfect 180 KCBS chicken the first time used in competition. It also has won sauce competitions on the circuit. It's best on ribs, chicken, or pork. However, it may be used for a sweet brisket burnt end.